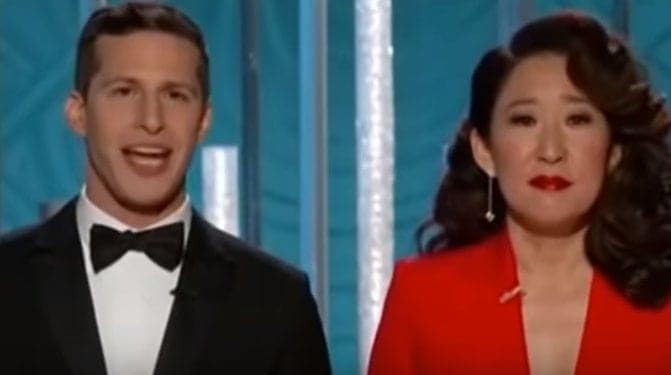 The man famous for playing police officer Jake Peralta in Brooklyn 99 showed he had nothing but contempt for the rules at this year’s Golden Globes ceremony. Andy Samberg hosted the glitzy affair, but it would be his joke about the Black Panther movie that had tongues wagging at the after-party. The Wakanda-based flick was nominated for a plethora of awards, yet somehow walked away empty-handed. However, fans of the Marvel film shouldn’t be too distressed. The Golden Globes are an indicator of what productions will secure Oscar nominations. The fight isn’t over, guys! Making reference to the civil rights movement of the same name, Samberg mused about what it would be like if members of the Black Panther Party actually auditioned for the film. Then, with a dramatic change in tone, The Lonely Island frontman dropped the hammer. Bluntly calling out the US government for state-sponsored atrocities? That took some balls, there’s no doubt. But social media users remain divided on the subject matter of the joke. Many feel it was unnecessary and ill-judged, whereas others revelled in Samberg’s decision to tell truth to power. Meanwhile, the arguable highlight of that video is the expression on Black Panther Director Ryan Coogler’s face. He’s somewhere between bemusement and horror, and doesn’t seem to know what’s going on.